Two superbly taken second half goals from Killucan’s Jamie Carr and Aaron Ready proved the difference in the U16 Championship Final where St Lomans lost out by four points to a determined Killucan side. The game was hosted by The Downs and played in perfect conditions on a clear Bank Holiday Monday last. Killucan started the brighter and kicked two points without reply with Devin Hill and Aaron Geoghegan on target. St Lomans settled into the game and controlled the remainder of the half scoring five unanswered points thanks to Fionn O Hara (2), Ricardo Lingi, Danny Mc Cartan and Nathan Mc McCullagh. 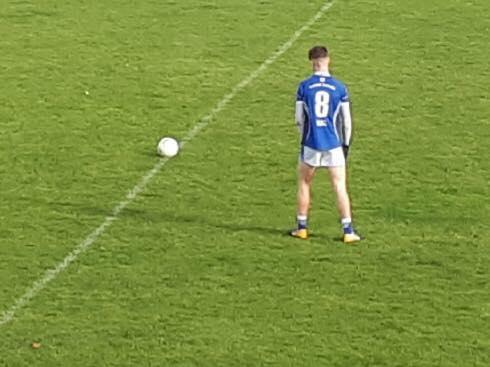 Some scores were the result of classy moves from the blues attack with Fionn O Hara and particularly the tigerish Mc McCullagh causing problems for the Killucan defence. The Blues didn’t have it all their own way and required some resolute defending throughout the half which included a wonderful block from full back Daire Smith. As the half time whistle blew it was St Lomans who had a three-point lead. Killucan raced out of the traps early in the second half and were soon level after points from David Weir, Aaron Ready and Sean Leech. Prior to Ready’s point the blues created the move of the match only to see Nathan McCullagh’s shot rattle off the post. Mc McCullagh put St Lomans back in front soon after, but his point was cancelled out by a Sean Leech free. It was clear that a goal was always going to swing the game and the blues had chances to raise the green flag, but it never came. Fionn O Hara restored their lead, but it was Killucan who soon found that elusive goal when Jamie Carr’s shot hit the roof of the net. O Hara pointed soon after as St Lomans tried to battle their way back into the game but a counter attack from Killucan saw Aaron Ready rattle in their second goal and seal the win for the deelsiders. Well done to players and management for their wonderful effort all year, it wasn’t to be on the day but there’s no doubt of the talent within this squad and the future is certainly bright. Finally, thanks to Niall, Kevin, Mervyn and all in The Chambers for the lovely food that was served to the lads after the game. Team; Rory Matthews, Keelan Sleator, Daire Smyth, Evan Johnson, Shane Daly, Alex Corroon, Jack Geoghegan, Fionn O Hara(0.04,3f), David Aughey, Bonvi Ndevi, Ricardo Lingi(0.01), Danny Mc Cartan(0.01f), Nathan Mc McCullagh(0.02), Hugh Mulhearn, Eoghan Hogan. There was no jackpot winner from the lotto draw on October 25th. The numbers drawn were 7,12,19,21. Winners of €50 each were Niamh Wallace, Mick Lynch, Tony Robinson and Eoin Heslin. There was also no jackpot winner from the lotto draw on November 1st. The numbers drawn were 3,8,14,15. Winners of €50 each were Trish Cronin, Joe Martin, J Scmidt and Johnny Nooney. Next weeks jackpot will be €5,900! St Lomans wishes to offer its condolences to the Reilly family following the passing of Francis Nally, Athlone, Co Westmeath and also to Reynolds family following the passing of Patrick Delaney, Lucan Co Dublin. Ar dheis íamh de go raibh siad.